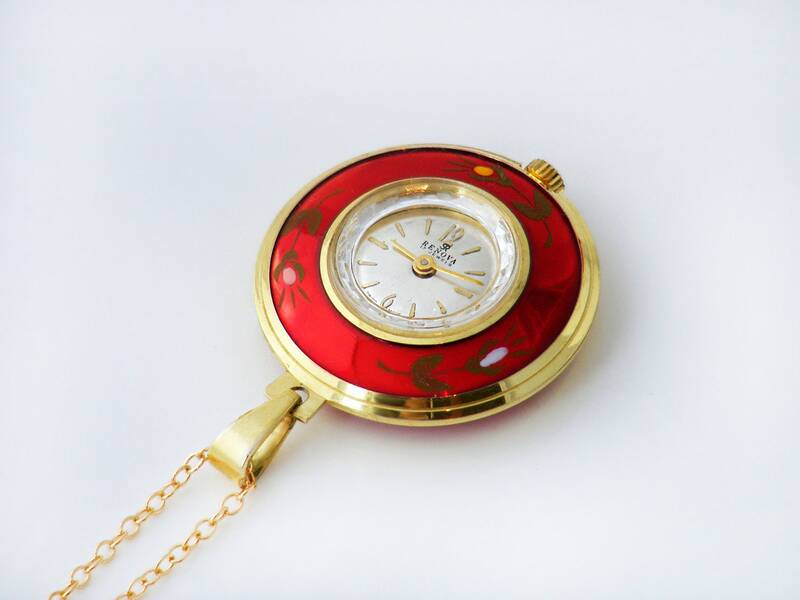 A Swiss made mechanical pendant watch from the 1950s in glossy metallic red decorated with sweet flower sprigs, in working order and keeping good time. 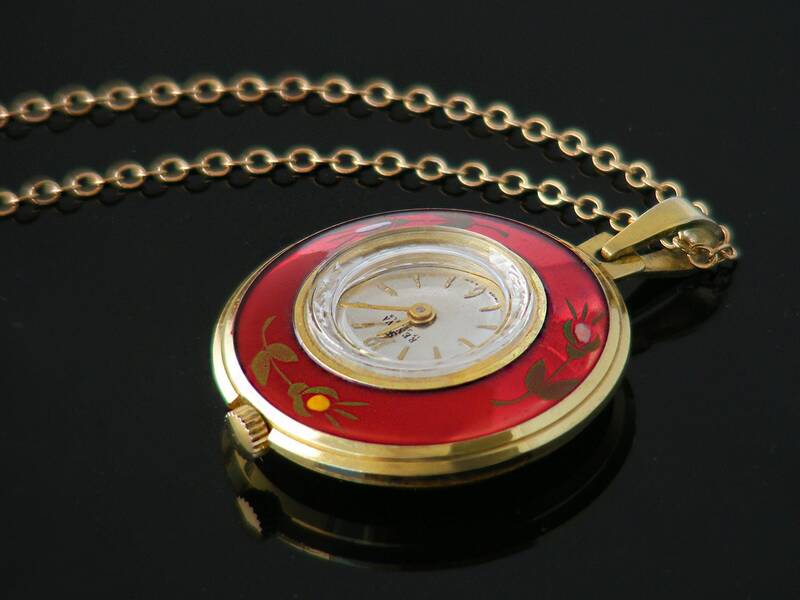 Popular in the 1950s and 60s and originally known as 'cocktail watches', pendant watches are both elegant and practical. This is an excellent working example. The face is marked with the brand name 'RENOVA' and 'Swiss Made' and '17 Jewels'. 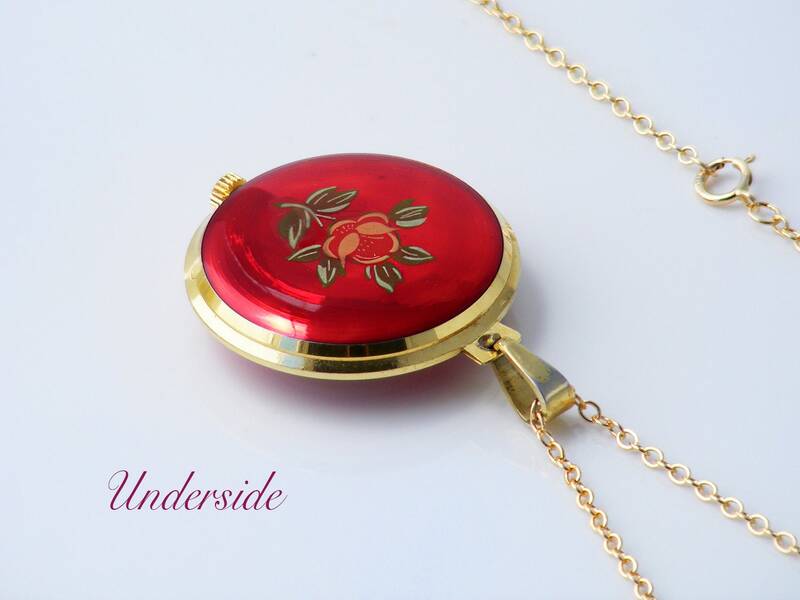 It is 'upside down' so that the time is easily visible to the wearer. 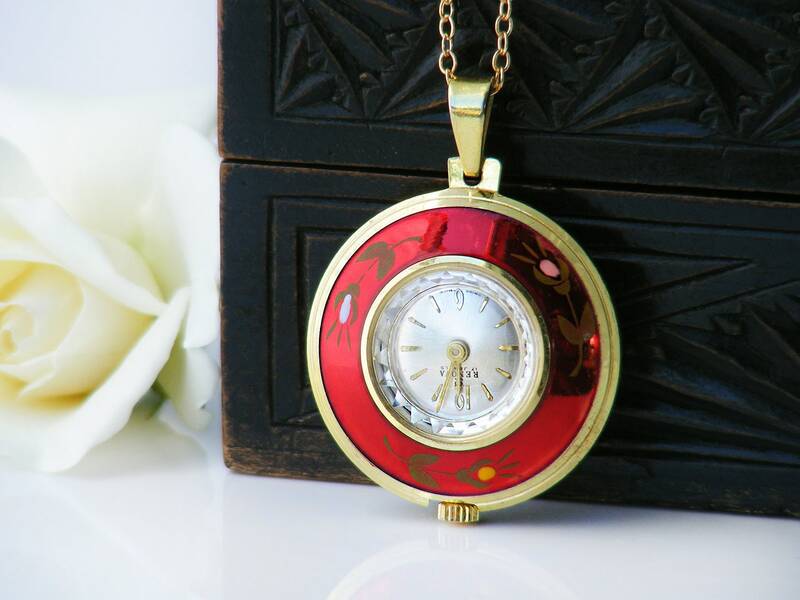 The 17 jewel watch is a round in shape with a perspex cover and a brushed metal face and gold hour markers. 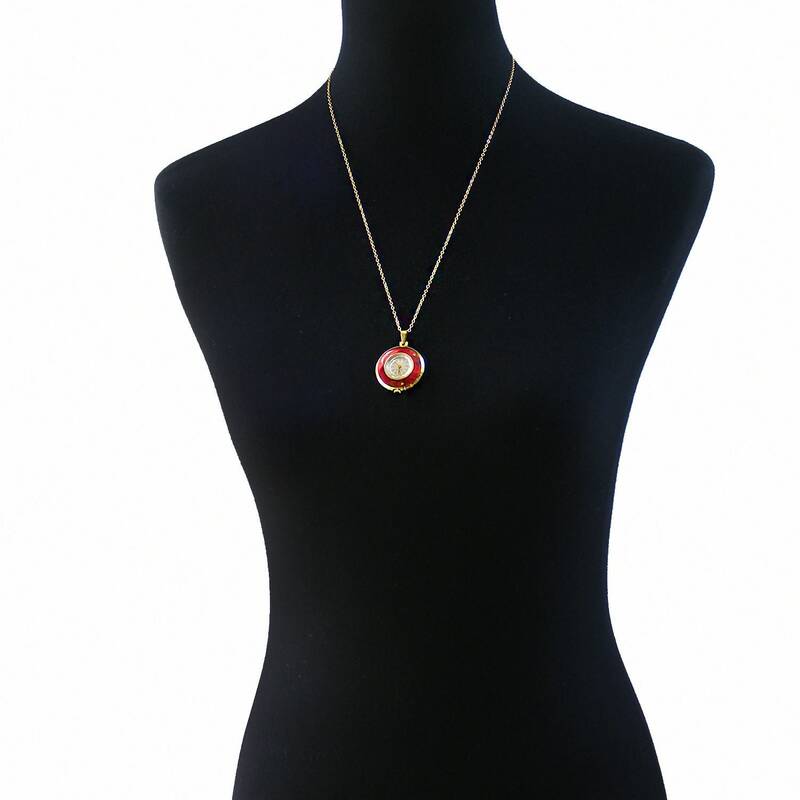 Size: 1.22 inch or 31mm diameter and the total drop from the chain is 42mm. Presented on a new, good quality chain, 24 inch or 61cm long, 14ct gold filled and stamped as such. Shown on a life size torso in image #3. Condition: Excellent. No issues to report. The face of the watch is near perfect. The watch has been very well cared for and is working well*, ticking away nicely and keeping time. *Please Note: the watch is mechanical and must be wound daily to keep time. If you are unsure how to do this, there are good instructional videos available. 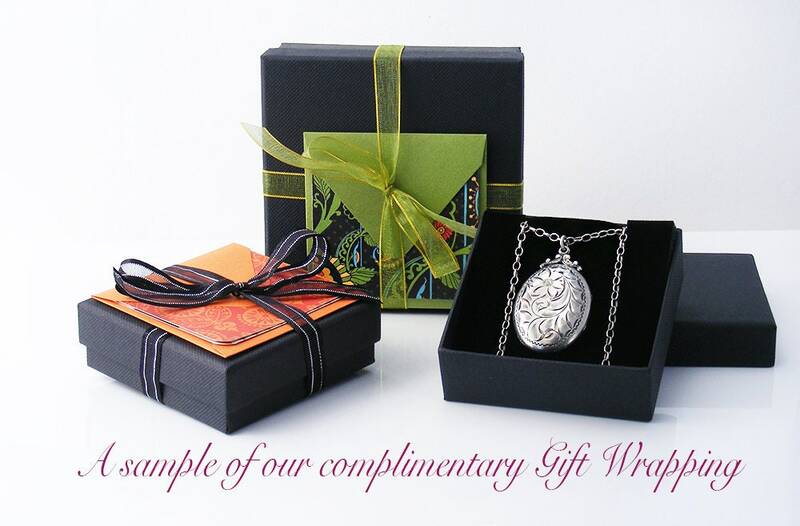 I have a few of these watch pendants in my collection and wear them often. I find them fascinating, yet very practical and they are a true conversation piece.